Recorded on May 20, 2012. 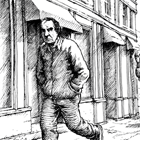 I feel like the American Splendor movie is superior to the comics & it makes me sad to admit that. The comics make me feel like he’s much more of a whiner than the movie did, which may be true….